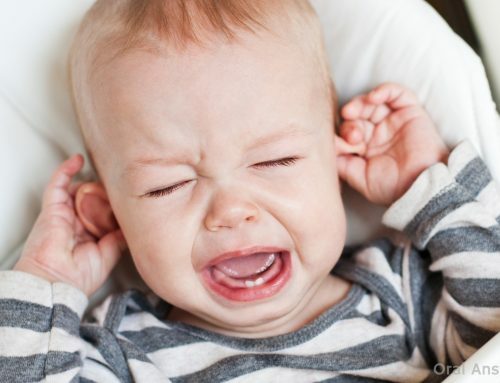 If Baby is handled by too many strangers or gets over-stimulated with loud activity she will also get fretful and cry lots, which can make her digestive system tense and bloated, which may even look similar to colic. Keep this in mind for the first three or four months and make sure that you don’t plan too many outings or activities. However, many babies do swallow a bit of air with their milk feeds, especially if they are fed on a schedule (as this usually overfills their small stomachs at the time of a feed, and gives them hunger pangs when they are kept waiting). The best preventative strategy is to feed your baby when she is hungry. Step 1: Hold Baby upright over your shoulder and rub her back. Walking at the same time and gently jiggling her will free trapped air bubbles while gravity stretches her torso. Step 2: Lay Baby face-down over your lap with her head higher than her buttocks, which will ensure that the gullet is elongated, and gently pat her back to free trapped air. Step 3: Hold Baby’s back against your tummy, place your arm around her tummy, and apply slight pressure to free air, aided by gravity stretching her torso. Step 4: Massage Baby’s tummy in a clockwise direction around his navel. Sit Baby on your lap with his jawline resting in the angle between your right index finger and thumb, and rub or pat his back with your other hand. Lift Baby’s left arm at the same time, as this stretch helps the air to be released. Massage the middle third of the underside of Baby’s feet (the insteps) with your thumbs – do this whenever your baby seems uncomfortable with wind.